We here at the OB Rag have been complaining for awhile now that even though we live in a coastal desert, there is no wide-spread effort to collect the rainwater that falls on our parched paradise. There is no government encouragement for it, our culture doesn’t support it – and we waste the opportunity every time it rains – and floods like it did last week. Well, there’s a woman in Point Loma who is showing us how to do it. 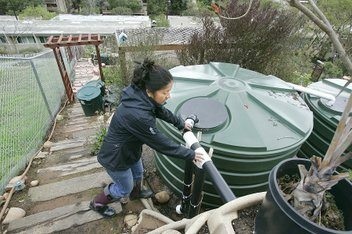 Cielo Foth has installed huge storage tanks and 44-gallon trash cans in her backyard to collect rainwater – which she uses for her garden. 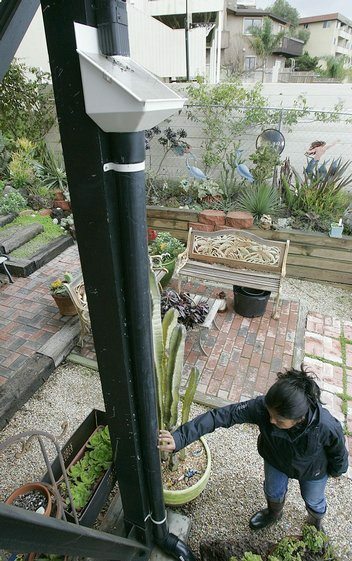 In March, Cielo Foth installed two rain tanks at her Point Loma home to capture more than 2,220 gallons for her elaborate garden. She has since bought nine 44-gallon garbage cans to increase capacity. She figured the recent storms gave her enough water for 2½ months of irrigation. Go here for the remainder of the article. I did an interview with Cielo late this morning and will be posting a follow-up piece. Only downside I can see is that rainwater can get caught and stored in un-covered receptacles. Mosquitos & West Nile disease. I’m not sure how much is hype, but I think the question needs to be addressed. you could always put a pump inside the tanks to keep the water moving, inexpensive and would be useful to avoid stagnant water. gold fish, my dad taught me that. Also, Dr. Bronner’s peppermint soap will float an oil cover on top that will keep mosquito’s from reproducing and also is non – toxic. Read the label!